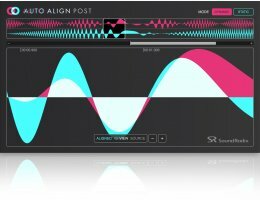 AUTO-ALIGN POST is an AAX AudioSuite plug-in for Avid Pro Tools, designed to automatically correct the delay and comb-filter phase issues occurring when mixing a recording of multiple moving microphones, such as in the case of a shoot set-up using a boom microphone in addition to an actor’s lavalier microphone or multiple on-set microphones. Until now, phase/time aligning multiple moving microphones was a tedious, time-consuming job that often required several ear-twisting days to complete. Building on the proprietary technology of our groundbreaking Auto-Align™ plug-in, we’ve developed a next-generation algorithm that makes phase/time correction of a moving multi-microphone recording of an entire film a matter of a few clicks and a short coffee break. Days of work are now a matter of ‘select’, ‘click’ and you’re done. That simple. Whether it’s a moving drama or still life, AUTO-ALIGN POST has got you covered. Supports sample-locked sum-alignment of up to 48 channels in a single pass.